Tehran-born, Copenhagen-based neo-expressionist Farshad Farzankia shook the art world when he left a job in advertising to pursue art in 2016. His large-scale paintings remix visual cues from the 80s to explore powerful narratives of immigration and identity. Farzankia’s Basquiat-like tendencies, where androgynous faces, figures and shapes appear beside vibrant pallets, make his works both appealing and curious. Africa’s oldest gallery, Galerie MAM is based in Douala, a coastal city in southwest Cameroon. This space, dedicated to promoting Plastic Arts and Contemporary Creation in Africa, is showcasing Nkongsamba-born Joel Mpah Dooh. The critically acclaimed visual artist observes the scenes and settings in his home country to explore themes of human identity and social interaction. He believes that only through conflict with society does one discover the ‘self,’ a figure hidden in the shadows and lines of his vibrant and dreamlike paintings. Hamra Abbas’s works are as diverse as the experiences that inspire them. Born in 1976 in Kuwait, the artist draws from a wealth of subjects – cultural history, violence, devotion and ornamentation – that stem from personal encounters. Her paintings intend to redefine images deeply enmeshed in the collective memory to deconstruct the act of seeing. Her marble-based work, Fruits: Gardens of Paradise, is on display at Art Dubai’s Bawwaba gallery – a new addition dedicated to artists from the Middle East, Central and South Asia, Africa and Latin America. Akar Prakar, a Kolkata and New Delhi-based gallery, is one of the leading promoters of Indian art. Participating for the first time in Art Dubai, the gallery is representing works by the late and renowned painter Jagdish Swaminathan who, in the the 1950s, dedicated to art full-time. His works, evocative and confrontational, stand the test of time with bright, abstract landscapes and natural sceneries that hide more than meets the eye. There’s no room for doubt that Dubai will celebrate its own rich tapestry of art and artists this year. Returning to Art Dubai is locally-based Gallery Isabelle van den Eynde with an installation by Hassan Sharif. The acclaimed Emirati artist was best known for his imposing sculptures that use everyday materials like jute and spoons to create unassuming yet enrapturing works to influence the space they inhabit. As if she wasn’t already a household name before, Yayoi Kusama’s Infinity Mirror Rooms in the social media era definitely turned her into one. The eccentric, Matsumoto-born artist grew to critical acclaim alongside giants like Andy Warhol, creating whimsical and experiential art loved around the world. You can see her 2016 acrylic painting, LET’S WALK THIS LIFE, on display at Art Dubai thanks to OTA Fine Arts. Zurich-based Pamela Rosenkranz is a visual artist whose work has made it to the renowned walls of New York’s Museum of Modern Art (MoMA). Her art ranges from paintings to impressive sculptures and structures. From stripping away socially-constructed ideologies to the emptiness and meaninglessness of it all, her work dissects what it means to be human. Her piece Express Nothing is on display, represented by Sprüth Magers. Mandaue City-based gallery 856G is representing works by Kristoffer Ardeña. The artist uses overlapping geometries and shapes to create paintings with immense depth and patterns. He looks to find beauty in the mundane, employing everyday objects in a manner that reimagines their identity. As an artist, Ardeña experiments with different mediums like painting, photography and installation to expand the spaces in which art can live. He will often reference iconic Filipino or Asian objects and patterns in his work, integrating them into his artistic identity. Jiří Georg Dokoupil is a famous Czech-German painter and graphic artist who was the founding member of German artist groups Mülheimer Freiheit and Junge Wilde. His large canvas-based works defy genre, leaning intentionally into dreamlike visuals that are entrancing and delightful. His static, amorphous figures, much like free-floating jellyfish, appear caught in the process of never-ending motion and transformation. Cairo-born visual artist Heba Y. Amin has an entire booth dedicated to her video wall at Art Dubai. The artist recently presented at the 10th Berlin Biennale and now brings her radical piece Operation Sunken Sea (the Anti-Control Room) to Dubai. The installation imagines the artist as the mastermind behind an ambitious plan to drain the Mediterranean Sea. Spinning the German architect Herman Sörgel’s similar proposal from the 1920s on its head, Amin explores imbalances inherent in power, politics and colonial convictions. 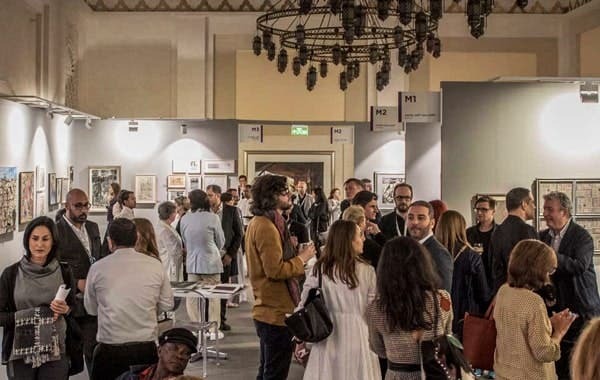 Find out more about Art Dubai on Dubai Calendar here.